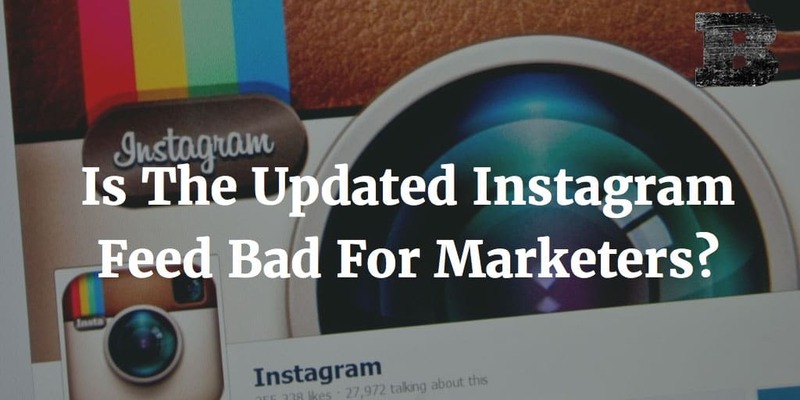 Is The Updated Instagram Feed Bad For Marketers? Home » Instagram » Is The Updated Instagram Feed Bad For Marketers? Instagram just announced huge news. They’ll be updating their feed to show you more of the moments you want. This means you’ll no longer see all updates in chronological order. Here’s what the updated Instagram feed means to marketers and how it’ll impact them. The updated Instagram feed moves away from showing all updates in chronological order and to a feed more like the Facebook News Feed (big surprise since Facebook owns them). This is a move that’s been coming for some time, even if many marketers wanted to deny it’d come true. The move to show people the content they care most about makes sense. Instagram says the average user misses 70% of the photos in their feed. That’s a lot of wonderful pictures we’re all missing. To make sure we don’t miss the moments that meant the most to us, the new feed will show you the shares they think are most important to you. Using a Facebook-style algorithm, Instagram can make sure you see the pictures from your best friends and the accounts that matter most. The accounts you engage with most often will be at the top of your feed when you return to the app, while those you care less about will still be in chronological order, should you want to scroll back and find them. While it may have been OK to show you every update when things were getting started on Instagram, with the average number of accounts users are following rising quickly, it just isn’t practical for most users to scroll through hundreds or even thousands of photos every day. This was a change that needed to happen and one we saw coming for quite some time. What Does The Instagram Feed Update Mean To Marketers? So, what does this change mean to marketers? Many will see this as just another way of social networks working to screw them. While this way of thinking seems common with every social network update these days, it couldn’t be further from the truth. This update had nothing to do with marketers and everything to do with providing the best experience possible for users. If users aren’t having a great experience, they’ll stop coming back and then we’ve all lost our opportunity to market to them. With the sky not falling, the updated Instagram feed provides a great opportunity for marketers. Your updates no longer have to be part of the 70% that go unseen every day. You can be sure your updates are seen by every one of your followers. Now that we know that this update has big benefits for the best brands, it’s time to look at how we can make the most of it. The answer is simple, and the same as every other social network; post great content that people love to engage with. It’s that easy. If people are engaging with your content frequently, the Instagram feed update will see that and be sure they don’t miss an update. But, if your content isn’t all that engaging, expect to see a drop, as users see less of it since their most engaging accounts will be showing up first in their feed. Engagements aren’t just about ‘Likes’ and comments either. Like the Facebook measuring video engagement, Instagram will also look at things like how long a user pauses on a particular post to indicate engagement, even if they don’t engage in the typical manner. Even attention grabbing images can garner engagement within the measured metric. Get people to pause long enough (to watch a video for instance) and you’ll have created engaging content in Instagram’s mind. The updated Instagram feed is awesome! It means that you no longer have to worry about your updates being buried under hundreds of crummy photos posted by others. Your updates can now rise to the top and be seen every time a user revisits their Instagram feed. The trick is continuing to create engaging updates that people love (if you aren’t already doing that, let’s talk). Knowing how the latest updates will impact our marketing efforts goes a long way towards helping marketers get the most from their social initiatives and helps drive social strategy. Now that you know how this update will affect your Instagram updates, you can craft content that is sure to not only engage your audience but keep you at the top of their feed. Time to kick up your creative content.